Hydrophobic water sounds like an impossibility. 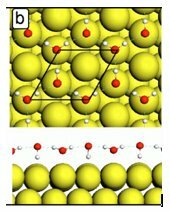 Nevertheless, scientists at Pacific Northwest National Laboratory (Greg Kimmel, Nikolay Petrik, Zdenek Dohnálek and Bruce Kay) have produced and studied monolayers of water molecules, deposited on a platinum substrate, which are hydrophobic for the subsequent growth of crystalline ice films. 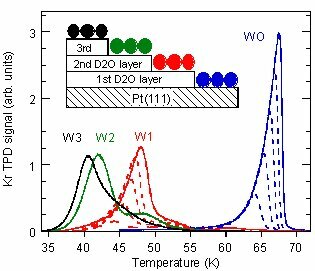 The new results are surprising since they overturn the conventional view that Pt(111) is a good template for the epitaxial growth of crystalline ice. Water–surface interactions are ubiquitous in nature and play an important role in many technological applications such as catalysis and corrosion. As a result, hundreds of experiments have been done on thin water films grown on metal surfaces with the aim of understanding how the film structure influences the interaction with other adsorbates, and the external stimuli such as heat, light or high-energy radiation. In an article in Physical Review Letters, the PNNL team uses desorption of physisorbed Kr atoms from thin water films to probe their structure. The desorption temperature of a Kr atom provides a clear signature of whether it was adsorbed on bare Pt or 1, 2, or 3 monolayers (ML) of water (Figure 1). The first layer of water wets the Pt(111) as expected. However, the 3-D ice crystallites that grow on top of this water layer do not readily spread out over the surface. The additional layers of water form isolated patches on the first ML. As more layers of water are added, the patches grow horizontally and eventually cover all of the first ML. For example at a water coverage of 2 ML, the ice crystallites only cover ~15% of the substrate leaving 85% of the substrate covered by just the water monolayer. Only for coverages greater than ~50 ML do the ice crystallites completely cover the surface (Figure 2). The structure of the water monolayer on Pt(111), which according to recent theory and experiments has no dangling OH bonds or lone pair electrons (Figure 3), is key to understanding the observations. The fully coordinated monolayer structure results in a hydrophobic surface on which water diffusion is facile. At high temperatures where large scale rearrangement of the films is kinetically accessible, the low surface energy of the hydrophobic water monolayer relative to the crystalline ice surface thermodynamically favors the formation of nonwetting, 3-D ice crystallites. Figure 1. Kr desorption is sensitive to the structure of the water film. Figure 2. (a) The hydrophilic Pt(111) substrate is covered after just 1 ML of water. 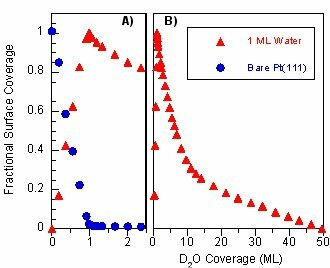 (b) The initial hydrophobic water ML is not covered until the total coverage is ~50 ML. Kimmel GA, NG Petrik, Z Dohnalek, and BD Kay. 2005. "Crystalline Ice Growth on Pt(111): Observation of a Hydrophobic Water Monolayer." Physical Review Letters 95(16): Art. No. 166102. DOI:10.1103/PhysRevLett.95.166102.